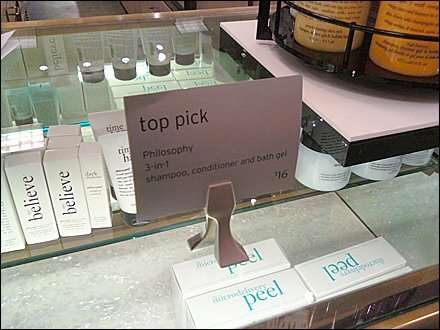 With the elegance of a designer creation, and the simplicity of a clothespin (albeit up-side-down) this sign holder looks great among the fashionable fragrance offerings of a premier department store. 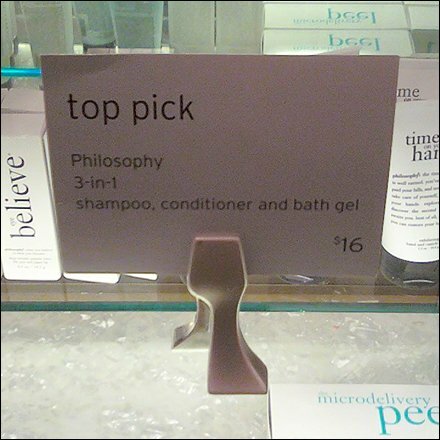 It points the sophisticated shopper to “Philosophy” as a “Top Pick.” CLICK the thumbnail for a better look. Scroll down for more table top sign stands and relayed fixtures.